Sometimes it can be quite frustrating when you want to share a movie, video or some other file with your friend and you receive a message that the Limit has Exceeded. This will not happen again, Pipe has come up with a solution to this problem. Facebook has launched an app called ‘Pipe’ with the help of which you can send files directly to your buddies.It will simply be like you are attached to your friend with the help of a pipe, one thing to note is that there will also be some lockers in the pipe. Pipe app has been launched by Pipe Dream Technologies which is a company based in Berlin. The app which had been in its beta version since May 2012 where users could join only on the basis of invitation and the main aim at that time was to identify technical issues which could come up. But the app has emerged as a real time file sharing on a social network like Facebook. The concept of pipe app is very simple and is based on drag and drop process. Pipe app will be used to establish a peer to peer connection between the sender and the receiver and will send files via it. To send a file you need to select the name of your friend from a drop down list which appears on the top left corner of the app. After you select the name you need to drag and drop the file onto an image of a pipe which looks similar to the pipe in Super Mario Brothers franchise. If the recipient is online then he/she will be presented with a window of 10 seconds to accept the transfer. If he or she fails to do so or is not online at present then app will present you an option to store the file in an locker. You can store up to a maximum of 100 MB of files in a locker for 5 days but there is no limit on the number of lockers you can have each friend. The recipient will get a notification about the pending file when they log in. Then the receiver can store the file on its desktop and the file will be removed from the locker. You can send files of up to 1 GB in size with this application. The best thing about the app is that the recipient does not even need to have the app initially and we can also transfer files even when our friend is not online. 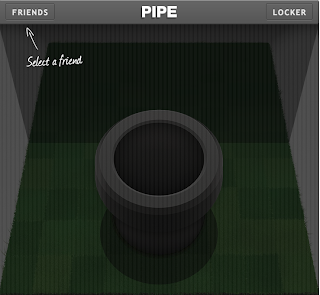 If you consider the pros and cons of the pipe app, then a big pros is the locker facility in the application. It makes it somewhat similar to E-mail but in a larger size. Also, as this app establishes a peer to peer connection, neither the Facebook itself nor the Pipe app is involved in the actual sending of the file. On the other side, one con that can irritate users is that it is initially slow and also is not able to store the files sometimes. Sometimes there might be a lack of notification or you will receive only one out of many files. This flaw can be improved with time and we can not neglect the ease of file transfer which is provided to us because of them. Pipe app has a great potential as it is first of its kind for the social network like Facebook. It also helps us to send files up to 1 GB which is about 40 times the initial limit of just 25 MB. According to the Pipe Dream Technologies CEO, this app will catch fast on Facebook which is having a million of users and is really the secure and fast way of sending large files. It will provide an easy solution to users and on the same side is not a competition to big file transfer services like Google Drive and DropBox. He says that the app will soon be launched on smart phones but the company is not yet ready. Enjoy sending files on Facebook with Pipe! !